It's All About Current Breaks and Structure Fishing! 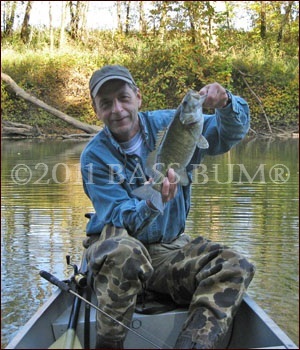 Stream smallmouth fishing and river bass fishing in general nourishes the soul and calms the nerves, taking the angler away from the pressures of every day life. I've had many pleasant days on small rivers and streams despite catching few fish. But other such days can deliver great river fishing filled with excitement from hooking up feisty river smallies or Kentucky spotted bass and even a largemouth or two. To catch river bass you'll need to understand their nature and know how to read the water you're fishing. Not unlike when fishing big water really, but not exactly the same either. As with all bass, river smallies and spotted bass gravitate towards three comforts that make bass habitat home, shelter, food and oxygen. However, though bass in country streams and small rivers hang close to structure and cover, just like big water bass, they relate to different kinds and in a different manner calling for specific river lures and river fishing techniques. Bass are going to be where there is food to eat, oxygen (dissolved oxygen) to breath and cover in which to hide and ambush prey. Ever seen a bass swim backwards? I bet not. Because they can't. In rivers and streams bass must face upstream. Otherwise they would be swept downstream head over tail. However, they won't hold in swift current because to do requires expending energy and burning calories. Living each day in swift stream and river current demands a high use of energy even without chasing prey. It's a continuous struggle against the current. This is why creek and small river smallmouth tend to be sleek and muscular. So whenever possible, small river and creek bass spend most of their time in deeper, calmer water, or as close to it as possible, in order to conserve energy. In river environs there will always be some current flowing in many speeds and even directions across any section of the river. These variations exist in direct relation to structural or cover features and their interference with water flow. River bass fishing success turns on finding objects that create current breaks. These current diverting obstacles include cover and structural features. 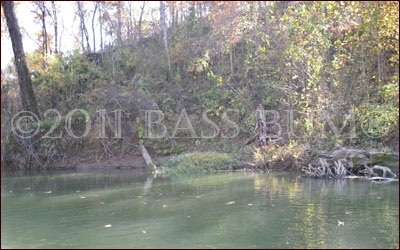 River bass will use the slower water around them to lie in wait and attack prey as it is swept downstream, slowed by rocks, small islands and downed trees lodged against the bank or jammed on a shoal. The reduced flow of water around these features also provides holding spots for ambush and rest from the continuous, unrelenting current and water pressure. When river bass fishing it's simple really. If you are not adept at identifying where bass are the most likely to be holding, most of their time, you will not catch many. If you fish spots where bass are not, you're not going to catch any. A small river or stream consists of a series of riffles, where there is shallow, fast current, runs, characterized by slower flowing, deeper water, pools, where there is deeper, calmer, slower moving water still and eddies, that are characterized by much slower current and relatively deeper water. So what are we talking about here? Why, fishing structure of course. Riffles are the life blood of a river or stream. They're where shallow water, a few inches to a couple of feet deep, flows rapidly over small,cobble to medium, football size rocks. This flow of water bouncing over rocks, creating waves and breaking the water's surface oxygenates the water. Riffles attract many of the prey on which river smallmouth and Kentucky spotted bass thrive like minnows, insects, sculpins and darters. The constant rapid flow of water works to dislodge some of the smaller prey, such as insects and nymphs, from the shallow rock. Smallmouth will be waiting. In early evening and into the night river smallies will move into the shallow riffles and feed on the larger prey like crayfish and darters. If a riffle drops into a pool, smllmouth will visit the more shallow riffle to hunt even during daylight hours as they have deeper water close by in which to make a quick escape from their predators. A deeper area of a river or stream with smooth surface water but where the current is often still deceptively fast. They're often the transition area between riffles and polls. Runs that form bends will create undercut banks with slower, deeper water. Though runs hold bass mostly at dawn or dusk they can hold bass any time of day. Like the nice two and a half, Elmo says maybe three pound, smallie at right, which Elmo caught at 2:00 in the afternoon. 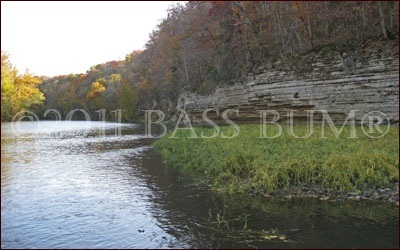 The smallie was hooked off the bank of a long river run, just out from the grass against the bank in the picture above. Pools are river locations where bass hang out much of the time. The current is slower because they "open up" the stream or river for some distance. They're also characterized by deeper water that provides bass safety from predators. Pools have three distinct places that are more productive than the rest of the pool. These are the head, tail and belly. High percentage spots when river bass fishing are where riffles spill into pools, the head. Bass will be there most of the time. A deep eddy pool will hold bass most of the year, especially in small streams, and feeding smallmouth will be at the head and in numbers. Pools with structure like rocks, logs and brush located within their central area are great! Real bass attractors. 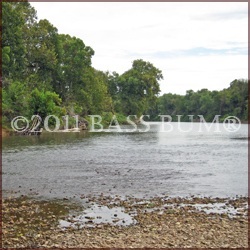 This area is what has been long referred to by bass fishermen as the "hole". Bass will position themselves around these structural and cover features and wait for prey to swim or float by. The bass they attract are often the larger bass in the area who have staked out the area as theirs. A pool's tail often has a structural feature that concentrates the water as it exits the pool. The result is an increase in current speed and a concentration of prey that has flowed through the larger pool area or is shaken loose by the increased current velocity. Bass relate to this and don't usually miss this opportunity for a meal. 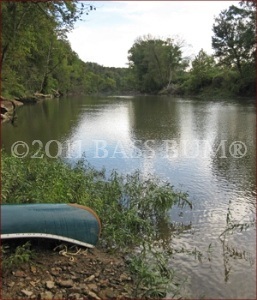 Another spot to look for when you're river bass fishing is an eddy. These are areas in rivers and streams where the water is slack or actually flowing against the normal current flow, doubling back on itself if you will. These are "back eddies". They're mostly found behind something interrupting the current flow. So look for boulders, woody debris like fallen trees or even a point that juts into the river channel forcing water around its tip. The faster the current and the bigger the obstacle creating an eddy, the bigger the eddy and the more rapid its circular flow. Bass hold in eddies in order to stay out of the current, though not often in their centers which tend to be dead water. Instead, you'll find them along the usually narrow "current seam". Boulders from the size of oil drums to a small car attract smallmouth bass to the small eddies created behind them. Eddies are important to those of us who enjoy river bass fishing. Bass hanging in small eddies just in the front of or behind a boulder. 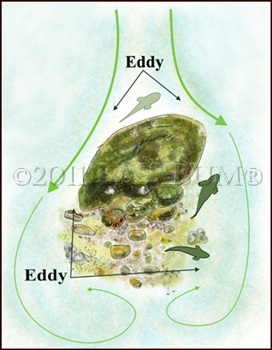 Or along the current seam, the aforementioned dividing line between the fast water, as it flows past the boulder, from the slower within the eddy, are usually in an active feeding mode. The illustration at right above depicts where bass will hold then dash out to feed on food flowing by.